This entry is part 4 of 7 in the series Cycling in Belgium. 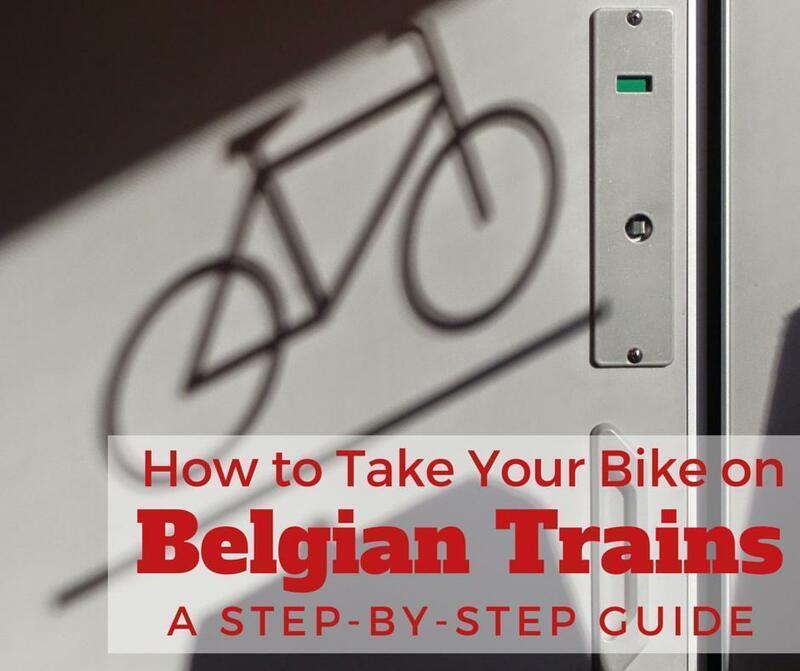 Today our guest contributor, Adrian, shares a practical guide for taking your bicycle on board the train in Belgium. All Aboard! As a passionate traveler, I enjoy discovering new places by bicycle more than I can explain. 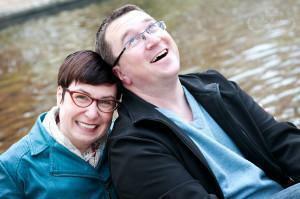 It’s challenging, healthy, and it also stimulates my sense of orientation. Needless to say, it didn’t take long before I covered most of my region by bike. Naturally, one day I wanted to go farther and explore more distant corners of Belgium, on two wheels. To do so, taking my bicycle on the train (and travelling to my desired start point) was one of the easiest and less expensive options. If you wish to take your bicycle onboard the train, follow me as I describe the steps to take such a trip. If your bike is ready, let’s go to the station. Long story short, in Belgium you are allowed to take your bike on any domestic train, regardless of its composition, for an extra fare. 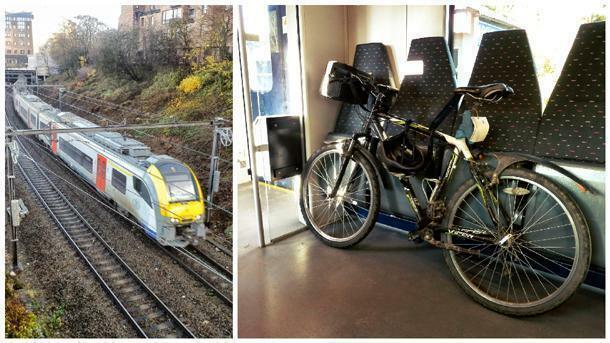 The SNCB offers two distinctive formulas: a bike ticket for one trip and a bike day pass. It’s always good to first find the conductor on the platform. He will see you have a bike, so he can lead you to the place where you can store it properly on board. However, this is not always necessary, as you will see next. 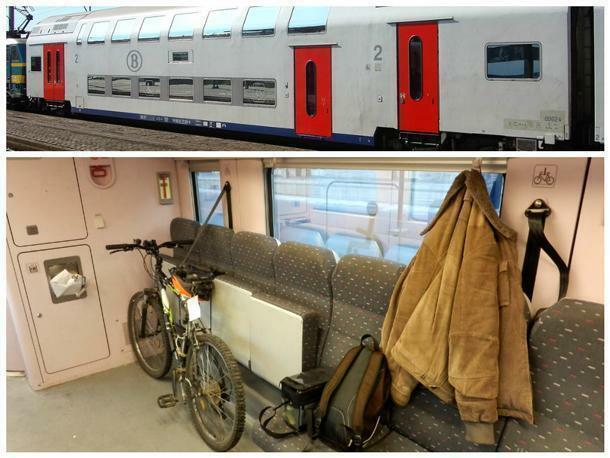 With one exception, all the SNCB trains have a specifically designed place for bicycles. In most trains (especially the older ones), this is a separate compartment, where large baggage items and bicycles are stowed. In other cases, the bike must be carried in the so-called multifunctional space. It’s mainly a seating area with folding seats, where passengers with reduced mobility and persons with large baggage have access. Let’s hang our bicycle! An AM96 EMU and its baggage van. I will not go into technical details. The important thing is, depending on the composition of the train, there may be only one area you can store your bike or there may be one for every two or three cars. But this detail is not important, because the first thing to do, as soon as the train comes to a halt, is look for the conductor. He can see you have a bicycle and he will take you to the nearest baggage space. In such a space, there are at least two places where you can hang your bicycle vertically. If none are available, a solution can be found to store your bicycle safely on the floor. Only the conductor can allow you to enter that compartment and he also needs to know where you plan to get off the train, so he can help you out at your destination. This way, you can always be sure your bicycle is safe. Then you can take a seat and enjoy the trip like all passengers do. In certain types of carriages, there is no such separated place for baggage and bikes. In that case, at least one of the cars is fitted with a multifunctional area, where passengers have direct access and where you store and watch your bicycle by yourself. A belt will allow you to properly attach your bike against the wall, to make sure it won’t fall. 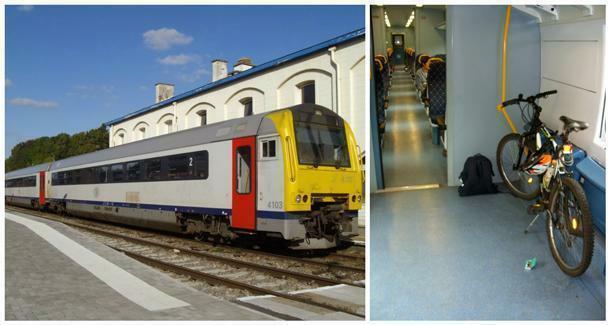 Since the introduction of the new Siemens trainsets, this multifunctional area can be found on more and more trains of the SNCB. The good thing is you no longer need to wait for the conductor in order to load or unload your bike. The bad thing is you must watch over it all the way. There is only one exception to what I have written so far: the border-crossing line from Liège to Luxembourg. Probably for compatibility reasons (between the two railway networks), this line is only served by one type of carriage, which has no designated area for bicycles. In this case, the best thing to do is see the conductor and come to an agreement with him. You will either store your bicycle in the small vestibule at the end of the coaches, or you will bring it into the seating area, if there aren’t too many passengers that might be hindered. If you can’t find the conductor quickly and you are afraid of missing the train, the best practice is to stow your bike either in the first hallway (right behind the locomotive) or in the last one. This way, you won’t create an inconvenience to passengers who might wish to go from one coach to another. As I said before, two formulas are available. If you know for sure you won’t come back the same day, then you will buy a one trip bike card, for 5€. One trip means traveling from point A to point B, regardless of the distance or number of connections. That is, you won’t need a new ticket for every train you board. But if you go on a one day cycling trip and plan to come back by train as well, then you will buy a bike day ticket, for 8€. Too expensive? Maybe. I also think it’s discouraging, knowing that in Belgium, alternative “green” means of transportation are supposed to be favored. It is also true that sometimes, on short distances, the bike ticket is more expensive than the train ticket itself. On the other hand, however, bicycles take up more space and, as I have already showed, some extra effort from the conductor is needed. For this reason, carrying a bicycle is an extra service that must be paid for. On the positive side however, personally, I also had some nice surprises: more than once was I invited by the conductor to take a 1st class seat, just to be closer to my bike. Of course, this was just an act of kindness you cannot ask for. All you can do is hope one day it happens to you. 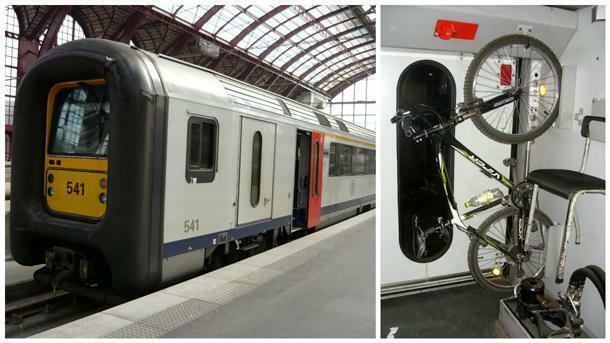 That’s all you need to know about taking your bike onboard the train in Belgium. You have no more excuse to leave your bicycle at home if you feel like riding it elsewhere, unless you wish to subscribe to a bike sharing service. But that will make the subject of my next article. Provincial Domain Kessel Lo, near Leuven, Belgium – a Family Paradise!